Happy last day of September! Yes, we’re a week into fall but I know what the beginning of October really means – Halloween! 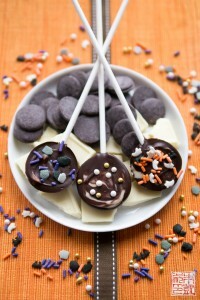 You can see from these Halloween chocolate lollipops we’ve already gotten a start on making some treats! Candy-making at trick or treat time used to be more of a chance to exercise my confectionery skills. But now that I’m trying to include Isabelle in the kitchen (or basically, keep her entertained so she doesn’t wreck the house while I’m busy baking), the baking projects become more like little creative exercises for her. 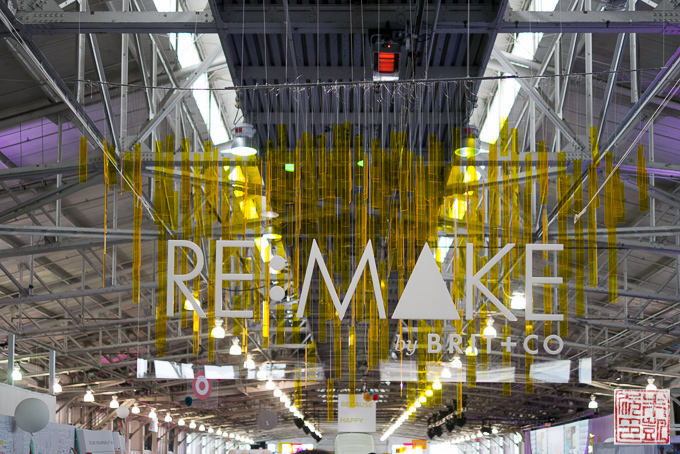 A couple of weeks ago I was invited to attend Brit+Co’s Re:Make Summit for creatives in San Francisco. 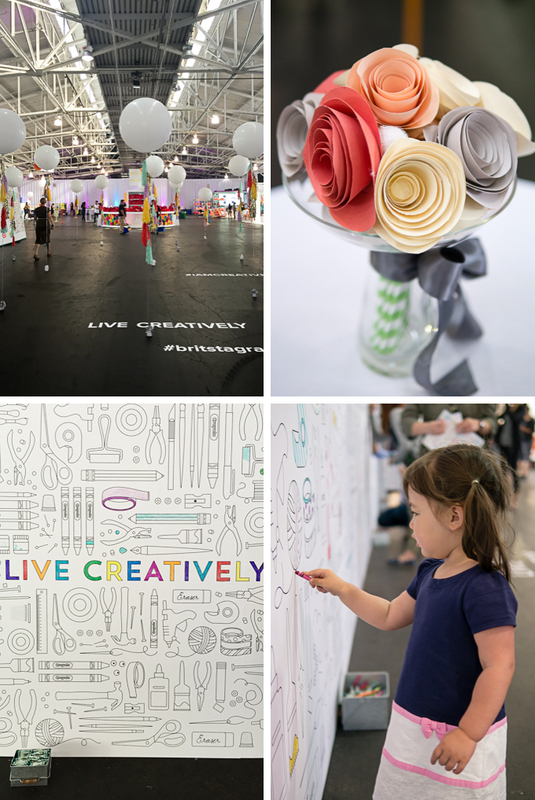 It’s part industry conference, part public festival, and mainly a super fun way to jumpstart your creative impulses and encourage you to get out of your comfort zone and try something new. Scenes from the Re:Make pavilion. The first day was a ticketed conference with speakers, demos, and some cool activities, while the second day the event opened up to the public and became a DIY festival and market. I brought the family along on day two, and that’s Isabelle you see there coloring on the giant “coloring wall”! Along with all the cool DIY inspiration there were also companies big and small showcasing some of their newest innovations. My favorite? 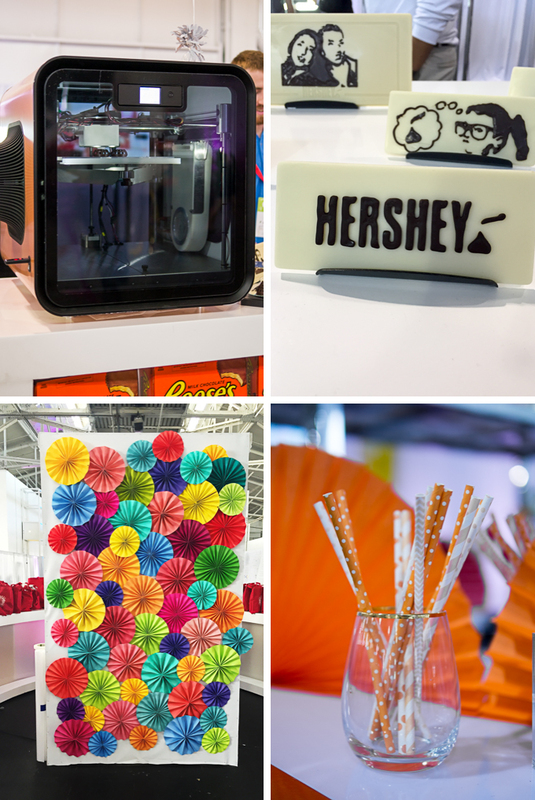 Hershey’s 3D chocolate printer (upper left), that can print out all manner of shapes and designs in pure chocolate! Throughout all my years of blogging, one of my constant challenges is maintaining my creativity. I see that question being asked all over the internet as well: how do I stay motivated? how do I come up with new ideas? everything’s already been done, what do I have to offer? As a engineer, I can deal with problems that have a clean and clear solution: how to install a plugin, how to resize my photos. But harnessing and expressing your inner creative spark-well, that’s been the challenge for artists all throughout time, hasn’t it? 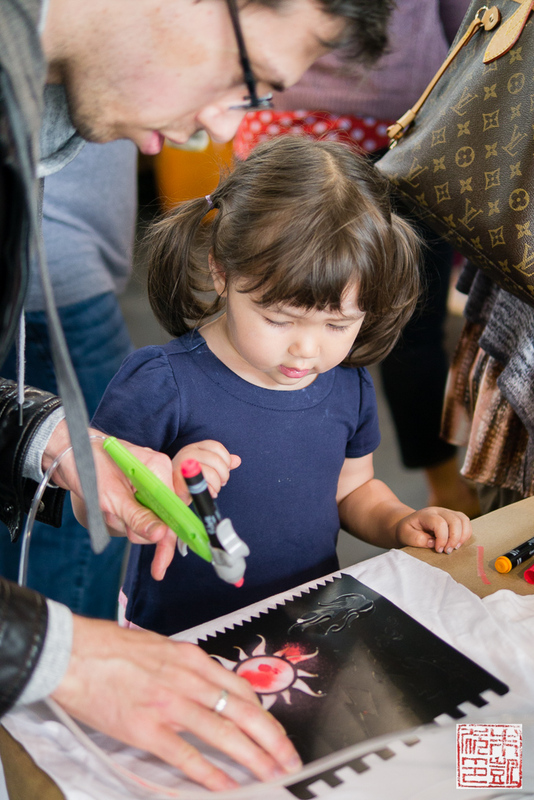 During the conference keynote, Brit Morin mentioned how she took inspiration from her young son, who would happily color and scribble with whatever crayon, chalk, or paint he was given. Children, Brit explained, aren’t concerned with perfection or whether their ideas are silly or impractical. They just create. One of the goals of Re:Make was to encourage us, as adults, to let go of our mental roadblocks and just enjoy the act of creating, and let that lead us. 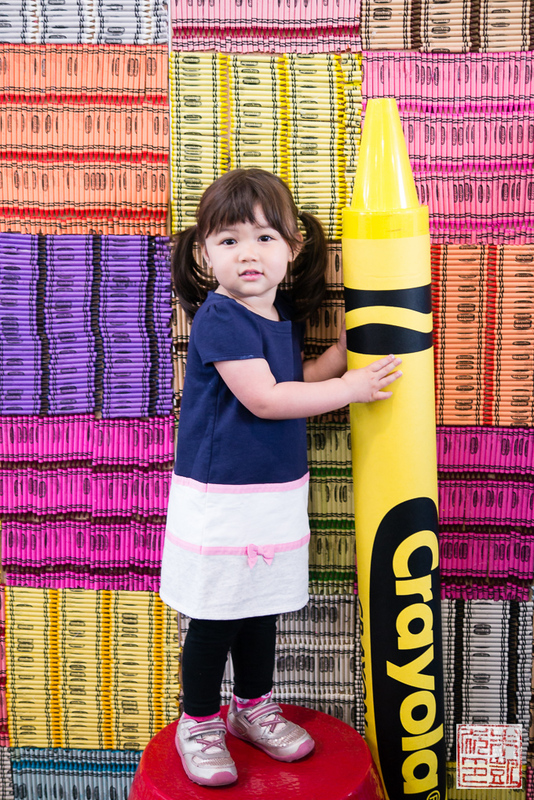 Dream come true for all the kids at the festival: a Crayola creativity center with giant crayons for posing! Isabelle did thoroughly enjoy herself at the festival: anywhere we don’t have to tell her, “don’t touch that!” or “put that back!” is heaven for her. Here she is making an airbrush shirt – we let her pick out the templates and the paint colors, and she got to airbrush away. Admiring her work – there’s no prouder feeling than watching your child happy with their accomplishments. It’s a good reminder that I should take the time to feel good about things I’ve done, instead of always thinking that I can do better. 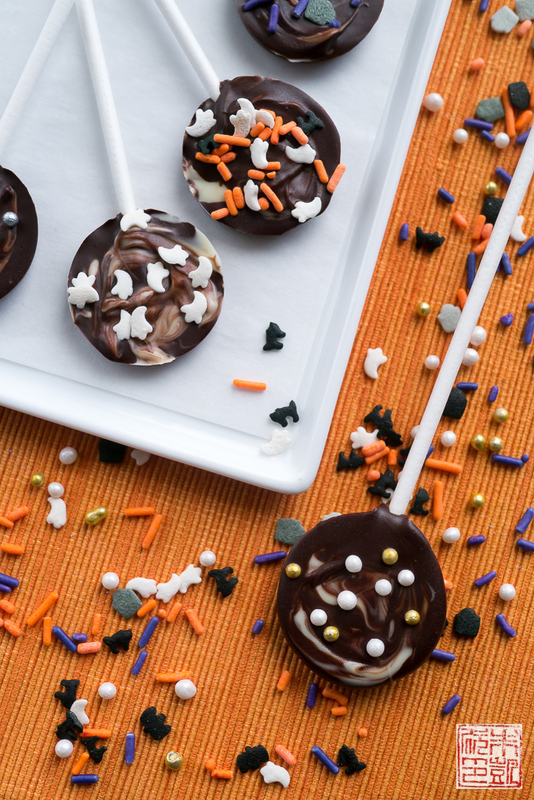 So now that Halloween is on the horizon, I picked these easy Marbled Chocolate Lollipops from my cookbook Lollipop Love to make with Isabelle- they are so simple to do, and look striking on their own, but they’re also very easy to jazz up with your own decorations. One of the best things about making lollipops is that they are so easy to customize; by adding some different colors, or covering with sprinkles or glitter, you can easily personalize them to any event. 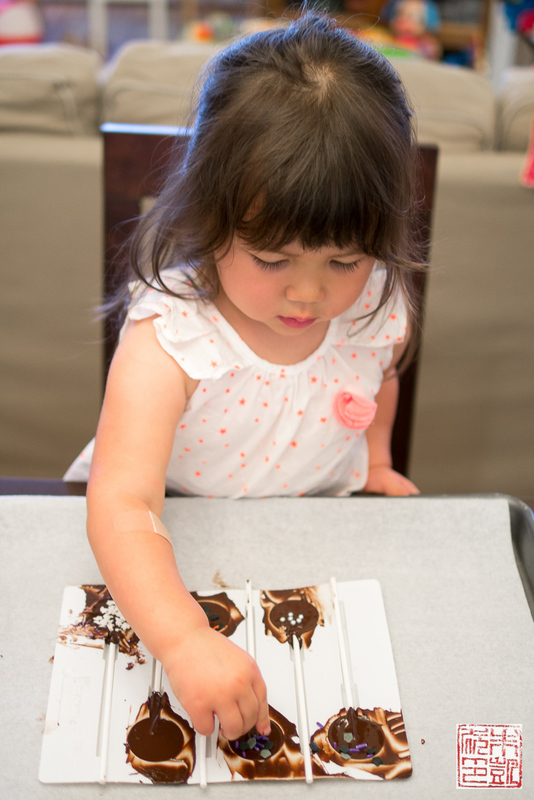 Once you’ve got the chocolate in the molds, you can set your child – or your inner child – loose and let them decorate to their heart’s content. Although you can make many lollipops from my cookbook freeform, without molds, I find it easiest to make these chocolate lollipops in lollipop molds as it helps them keep their shape as you swirl the two chocolates together. My preferred molds for these lollipops are 1 1/2″ round ones, similar to these lollipop molds . 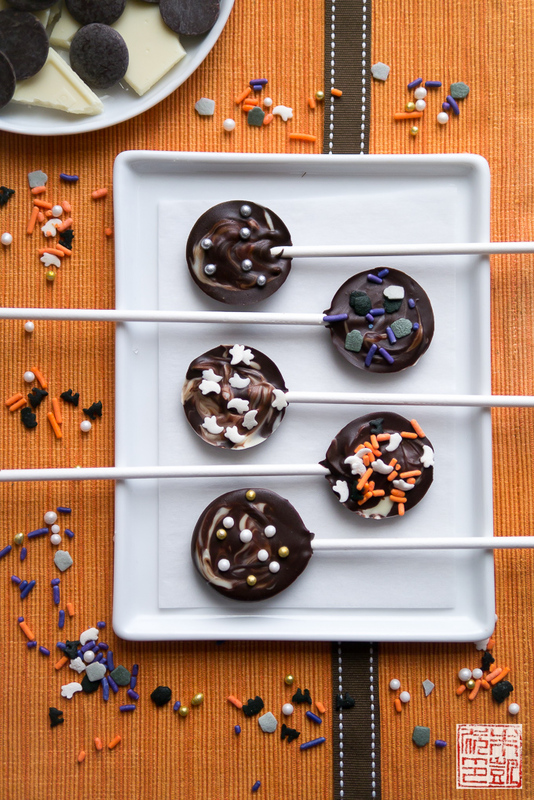 There’s no tempering of chocolate required for these lollipops – you can simply melt chocolate in a double boiler, or even the microwave. For the white chocolate, I’ve found that using premium white chocolate (my preference is Valrhona Ivoire) is best. White chocolate is very sensitive to heat and can burn easily, so using a higher quality chocolate is worth it; it melts more smoothly. Chop the white chocolate finely to help it melt evenly, and melt it in a double boiler over gentle, not high heat; slowly melting it will help it stay smooth and prevent scorching. Isabelle is already used to stirring batters together and rolling out dough, but she seems to be a special kick out of playing with sprinkles and edible glitter. Give her a tray of candy decorations, and she’ll be happily engrossed for a good long time, painstakingly picking out a colored jimmie or sugar crystal to place on her cookie dough. Here she is helping get into the Halloween spirit by placing some bats, ghosts, and gravestones on the chocolate lollipops. Tip: although for very small kids it may seem easier to keep sprinkles in the shaker jars, I’ve found it can actually make more of a mess as kids just shake sprinkles all over the floor. Instead, I pour a small amount out into a muffin tin lined with cupcake papers; it’s a good way for kids to practice their dexterity as they pick out sprinkles to place by hand. Make sure you choose ones that aren’t too hard to them to grasp – flat shapes like ghost and pumpkins work well. Round dragees tend to shoot off and roll under the table and sofa. Checking out her lollipops before we put them in the refrigerator to set. 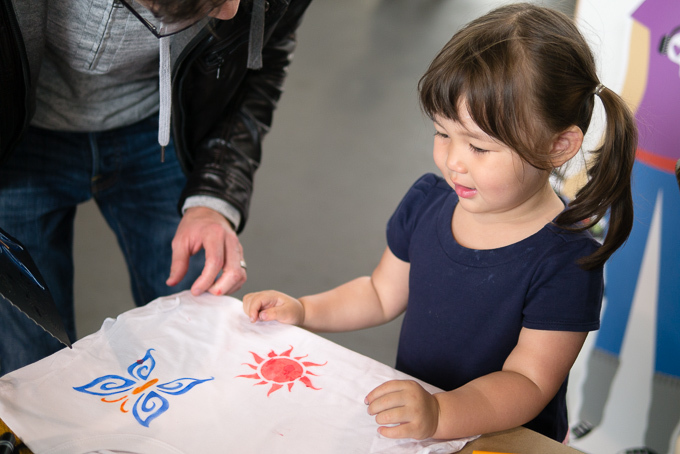 Even if they aren’t picture perfect, Isabelle enjoyed herself and she got to make her own creative decisions, which I hope will encourage her to keep finding ways to express her creativity in the future. And bonus, some Halloween candy we don’t feel as bad about letting her eat since we made it ourselves! Lay out chocolate lollipop molds. Place lollipop sticks into each cavity. Melt bittersweet chocolate in a double boiler or in a metal bowl set over a saucepan of simmering water. Melt white chocolate in a double boiler or in a metal bowl set over a saucepan of simmering water. Drop small spoonfuls of dark chocolate into each cavity. Drop small spoonfuls of white chocolate into each cavity. 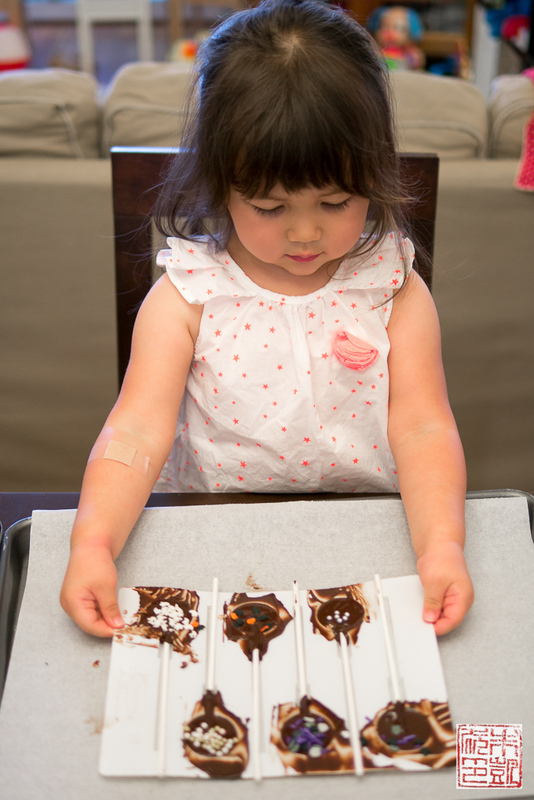 Use a toothpick to carefully swirl the chocolates in each mold. Place lollipops in the refrigerator and let set, about 15 to 20 minutes. Store lollipops in an airtight container between layers of wax paper in the refrigerator for up to one week. the 3d printer was so cool! did you check out the shave ice in the back? they had housemade syrups and the passionfruit was particularly tart and delicious. didn’t have a chance to try out the diys; all of the lines were crazy! This looks so fun! My kids would love it too! And I love these lollipops! Your daughter is just so adorable! This looks like a really fun conference too! WOW! What a cool event! Looks like there was so much to see and try out and your daughter had a blast!! Love these Halloween lollipops…must make them for the kiddos this month! These little lollipops are so adorable, my kids would love them! This is such a fun idea for the kiddos. I love cooking with my kids! What a wonderful event and so nice that you could share it with your adorable daughter! The kids can have the candy, I’d love one of these on Halloween! A 3D printer that prints in chocolate? OMG, that might be the coolest gadget ever! 🙂 Sounds like you saw a lot of awesome, inspirational stuff, though… wish there was an event like that up here in Toronto. This looks like my kind of place…colorful and interactive! The photos you’ve taken of your little Isabel are priceless. Looks like she had a blast! I love your chocolate lollipops too. Great fun for Halloween!